Flash! Friday # 28 — WINNERS! I knew you all would come up with hilarious, terrifying, creepy, stirring adventures for our poor Lady of Shallot. If only Waterhouse and Tennyson were around to weigh in, eh?? (Maybe we’ll save that for a future contest… heh heh.) You all continually amaze me with your inventiveness and skill. Thank you for coming out to play! Thanks too to judge Kinza Carpenter Shores for her fine work this week. Thank you, all! Judge Kinza Carpenter Shores says, I love judging but was sad this week not to be able to write for it too! What a compelling prompt. The stories were all so wonderful. Seriously. Sooooo many good stories! Dawn Nikithser, “Captaining.” I loved the poetry. Really well written, it had a very inviting cadence and rhythm. The sentiment was clear and strong and the imagery beautiful, and even though it is flash fiction, I do love fiction that can sound of poetry without being trite. Sinead O’Hart, “The Return.” This one had a great twist, and felt different from the other escape plots that seemed more similar to the original storyline of the Lady of Shallot. You really felt a twinge of fear and worry at the end when you realize that she is stuck where she began from. You relate to this character easily, even though the story is but a hundred words long. Causing someone to be able to feel that is good, consistent writing and characterization. I wish I knew why she was trying to escape! M.T. Decker, “Immortalized.” This one completely took me by surprise. It was really well written with a great twist. Haunting, creepy and took the story in a direction that no one else did. I was quite impressed. for “The Offering.” This was my absolute favorite dragon story that has ever come about from Flash! Friday! 🙂 It was intriguing, fit the prompt, full of imagery, and also – not what I expected. There were a couple that went down the sacrificial route, but I love how Sarah’s tale incorporated a dragon and the promise of an adventure. I liked that the dragon took human form and shape shifted at the end. It really threw you off as to how it was going to resolve. Really great piece! Congratulations, Sarah! Here are your Winner’s Page, your glowingly gorgeous eBadge (below), and your winning Tale. Please contact me asap (here) with your email address so I can interview you for Wednesday’s Sixty Seconds feature. Thank you to Judge Kinza Carpenter Shores for her very kind words. The Lady of Shallot is one of my favorite poems and paintings. 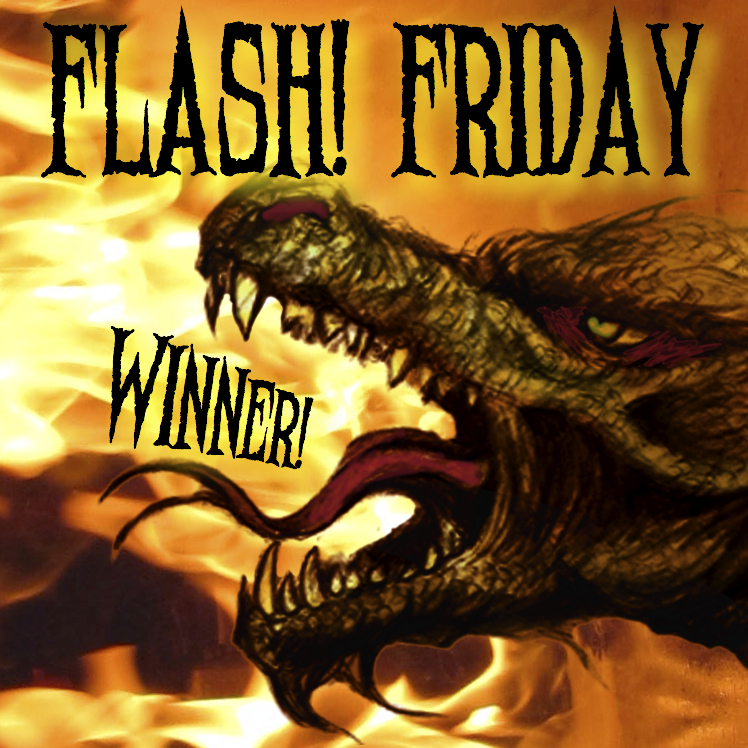 Thanks also to Rebekah Postupak, fellow dragon lover, and sponsor of this contest. You both rock! Well done! Gave me a chill!